Nothing pleases me more than finding delicious new chocolate items that are also gluten-free. Many traditional recipes for sweet, almond flour cookies, macaroons and marzipan omit (wheat) flour. So, I was hopeful that I could find chocolate and almond cookies with no gluten ingredients. 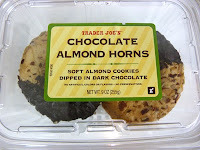 And so it was with these Chocolate Almond Horns from Trader Joe's (Monrovia, CA). 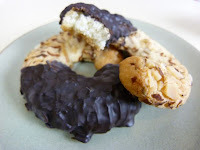 Sugary sweet, chewy-soft, golden brown, covered in sliced almonds, and partially dipped in bittersweet chocolate, these cookies channeled the ghost of marzipan cookies from childhood. I stopped eating gluten/wheat in 2002, so it's been many years since I nibbled on almond croissant or bearclaws. These two crescent-shaped horns were just as satisfying as any breakfast pastry or bittersweet almond cookie that I can remember. 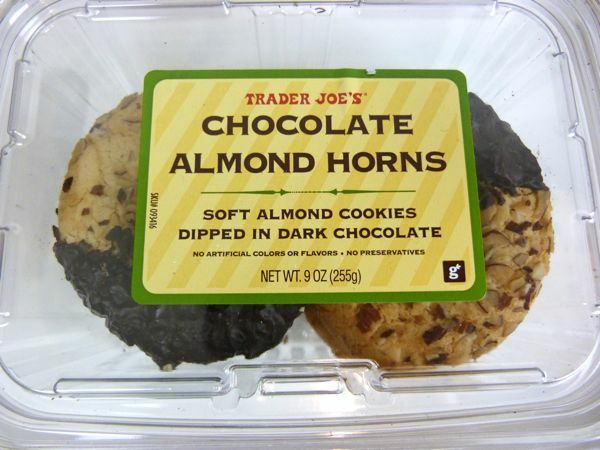 Couple two Chocolate Almond Horns with a hot beverage of your choice, sit by a fire, listen to (or play) some music -- and you have a great prescription for holiday contentment.